E85 Fuel Additive by Amosil. E85 users, need to pay attention to water separation in your tank during the Winter season. This is known as "phase separation" of the water and the E85 fuel floating above it. Ethanol in fuel has a tendency to absorb water and separate from the gasoline, sinking to the bottom of the gas tank, where it quickly degrades and creates gum, varnish and other insoluble debris that can plug fuel flow passages and negatively affect engine performance. When this ethanol/water mixture is pulled into the engine, it creates a lean burn situation that increases combustion chamber temperatures and can lead to engine damage. AMSOIL Quickshot is designed to keep water dispersed throughout the tank, moving it out as a normal part of operation and decreasing the chance of ethanol separating from the gasoline. SRP$18 per bottle plus postage. Promotion of just $20 delivered for one bottle or $35 for 2 bottles. If you need more just add $13 per bottle on top of the $35 for 2 bottles package. PM me your orders or and questions. how often do you need to use it - one tank per month or more? Usually about once every 3rd tank or so, depends on the difference in the weather as the greater the difference in weather, the more chance of condensation in the fuel tank. Interesting product! I was well aware of the separation in E85 but wondering if it's beneficial in E85/98 dual map cars. I run 98 through my car after a few tanks of E85, does it really add any value to my use or is it intended for E85 only vehicles? Lately here in Melbourne, the nights have been really cold in single digits and wet...a concern when your engine starts running lean due to this water separation problem. 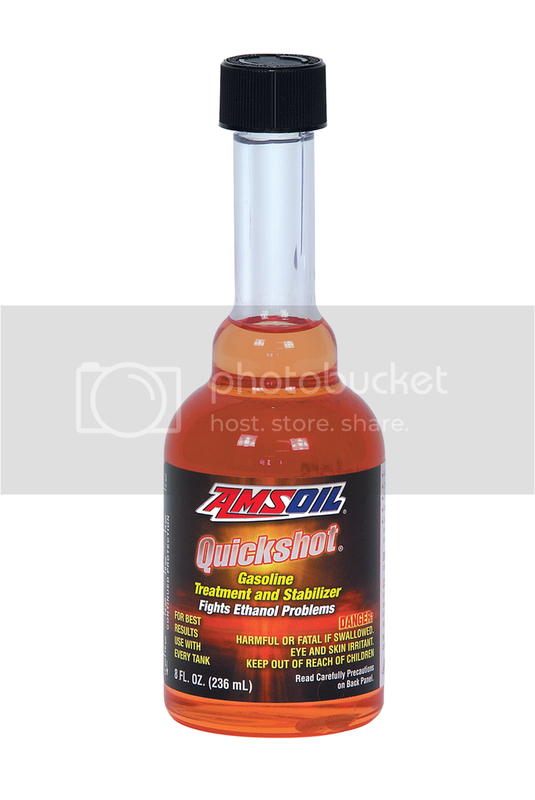 AMSOIL Quickshot® (AQS) is a premium fuel additive formulated to thoroughly clean and restore peak performance in small engine and powersports equipment fuel systems.